Guided visits around the concepts of dance, image, sound and heritage are available for the general public. Specialists of each area will engage with the building and the exhibitions in it from their own field of knowledge and practice, offering an approach to Bombas Gens’s programme that combines different sensibilities and artistic experiences. Check the scheduled visit every week here. 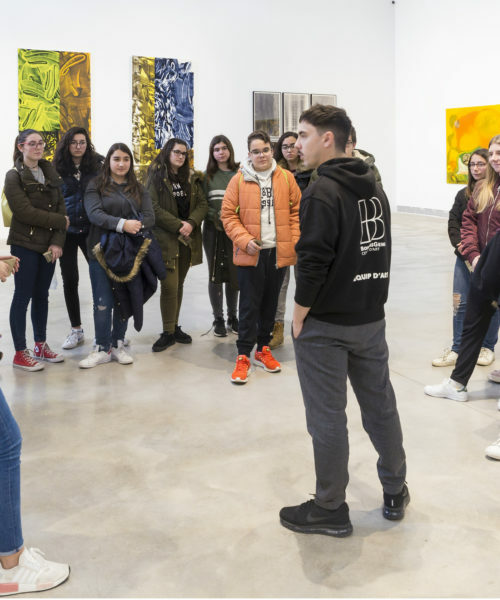 Bombas Gens makes available to visitors and users of the centre a team of cultural mediators – people trained in art history and humanities – that facilitates the access to the content of the exhibitions and to the historical context of the building. Our mediators are available free of charge and can help you with the visit, answer the questions you might have about the programme of the centre, which includes exhibitions and other activities, and offer the opportunity to participate in a guided tour on the following hours with previous registration. *Tour visits for groups of 8 people or more will take place on Thursday (16:15 and 18h) and Friday (11:15, 12:30 and 16:15h) prior reservation. The shelter and the wine cellar have a capacity of up to 20 people. Tour visits on the history of the fabric, art exhibitions and the garden have a capacity of 30 people. Contact us for further information about availability, schedule and booking. Weekend booked visits do not admit groups. *For the visit to the shelter and the cellar it is essential to know the warnings that are detailed here and accept the conditions that are listed here. Wearing comfortable footwear is recommended. *The garden with Cristina Iglesias’s sculptural work can be visited by guided tour only. Every visit organised by us —both art and heritage— includes the garden in its itinerary. *Visits organized by staff from outside the center must be notified at reception in order to follow the protocol established by the centre. If this is not the case, the visit will not be allowed. The Fundació Per Amor a l’Art is a non-profit organization that promotes Bombas Gens. Both the entrance to the art center and the participation in its activities or guided tours are free.